These case studies of six farmers in four Colorado River Basin states highlight innovative drought mitigation and resilience in the Arid West. 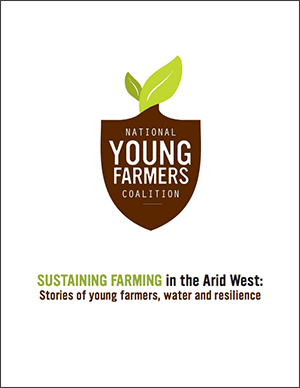 DURANGO, CO (Aug. 14, 2014) – The National Young Farmers Coalition released a report today highlighting innovative farmers who are adapting to record drought in the arid Southwest. “Sustaining Farming in the Arid West: Stories of young farmers, water and resilience” demonstrates how Western farmers are saving water, stewarding the land and enhancing productivity in increasingly dry times.